From the best I could tell, this is the closest to an actual Mayor's Office that the Old City Hall had. There may be another room that was used, but this little ante-room was right off the Commission Chambers and was labeled the Mayor's Office (or so I remember). I never saw it in use by the Mayor or any of the Commissioners, but it looked like it got some serious use over the years. 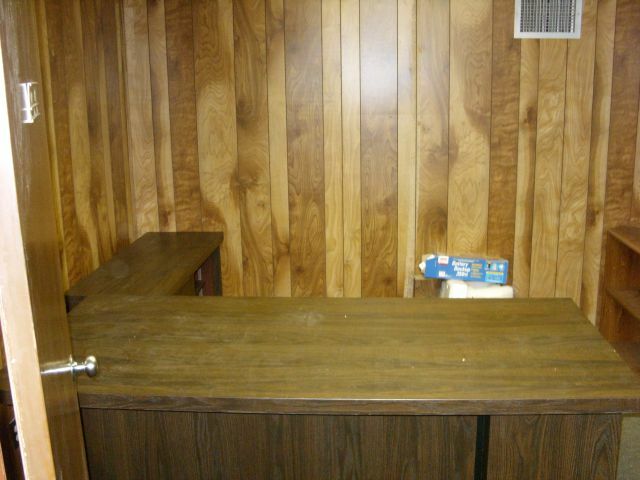 It was resplendent in 1970s paneling and had no windows. The desk you see was standard size, and you can see the credenza just behind it. On the right wall there's a book case and that should give you some idea of how small this room was. I put it at about 10 feet square. 100 square feet of cramped office. While Yes, it is a small town, I would say this would be a bit too minimalist for our city. I actually felt claustrophobic being in that room. The evening Jim Stork was sworn in as Mayor, and just before the swearing in, John Fiore was sitting in that little cubby hole. He looked so alone. I went in to shake his hand and I felt bad as the tears were in his eyes. And that is how I will remember that space.